This has been a busy week, and a week of surprises. I never expected the number 3 post for this week to be last week's top 10 post. It has also been a week of adjustment. Going from an article every day to one on Monday, Wednesday, and Friday, and a recap on Saturday has been oddly stressful. I keep thinking I should be doing something besides working on my other projects, and then I realize that I am having a weird withdrawal of posting every single day. If it keeps up, I may have to go back to daily postings. LOL! Charles and Susan are both wrapped up in projects of their own, which is why they so seldom write posts for the blog. 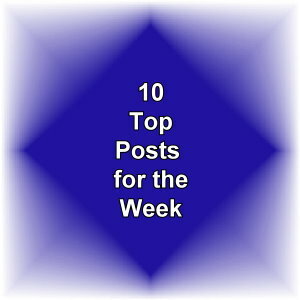 This week, some of the older posts made the top 10 most popular. I was excited to see the Word Tips and Tricks and Collectible Cookie Jars posts show up. If you would like more technology articles, such as numbers 8 and 10, be sure to let me know. Thank you to all my readers. I can't tell you how much you are appreciated!